Look at this treat we have planned for you in December! Each novella can be read as a standalone, but they’re all connected by one special angel. Since then, the angel has been passed down, sold, lost and found, but its magic remains. Read the romances inspired by (and perhaps nudged along by) the Christmas Angel through the years. Whether it’s the 1700’s England (Eli Easton), 1880’s New York (Kim Fielding), the turn-of-the-century (Jordan L. Hawk), post World War II (L.A. Witt), Vietnam-era (N.R. 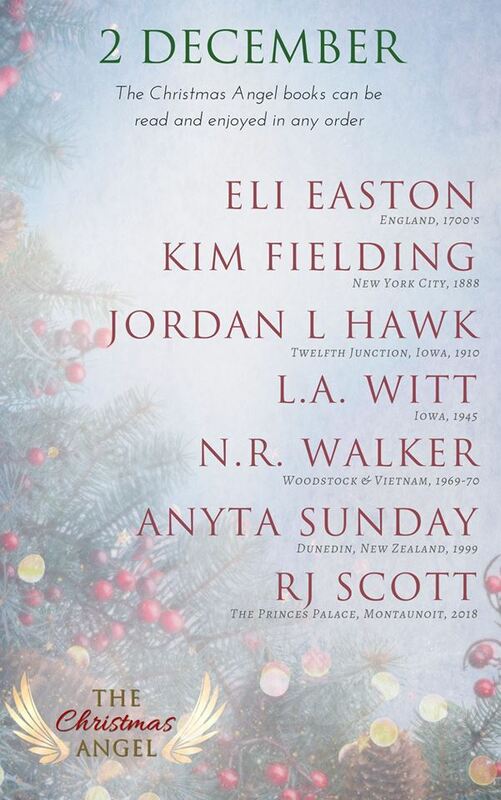 Walker), the 1990’s (Anyta Sunday), or 2018 (RJ Scott), the Christmas Angel has a way of landing on the trees of lonely men who need its blessing for a very Merry Christmas and forever HEA.